HubSpot is an inbound marketing and sales software that can help take your business to the next level. The Internet has dramatically changed the way people make their purchasing decisions. Buyers are more informed than ever. They're prepared to ask more questions than ever and are demanding a new level of service. Traditional marketing techniques are no longer effective. Traditional mediums (TV ads, emails, direct mail and cold calls) through which companies previously reached their target markets are now simply a waste of resources. HubSpot was one of the first to identify this breakdown of old-school marketing techniques and became a leader in transforming successful marketing into the inbound marketing formula. More people use HubSpot than any other marketing platform and there is a good reason for that. Inbound marketing, recognizing that old-style interruptive marketing is a thing of the past, focuses on the demand for a more consumer-centric style of marketing with an emphasis on providing valuable content. Currently, most buyers start their buying process online. Buyers inform themselves about options available before reaching out to solution providers. Savvy marketers know that it is important to be visible right at the very beginning of the buyer's journey. Visibility is achieved through website pages, blog articles, content offers and social media messaging - all optimized to drive high-value leads to your website. HubSpot provides the tools and training necessary to increase your visibility amongst the consumers that mean the most to your business. Before starting, take the time to understand your buyers. Creating great content and fine tuning your message only counts if it finds the right listeners. Personalize your marketing, identify your buyer’s needs and understand what content pulls your best leads through sales funnel. HubSpot is the perfect tool to help you do this! 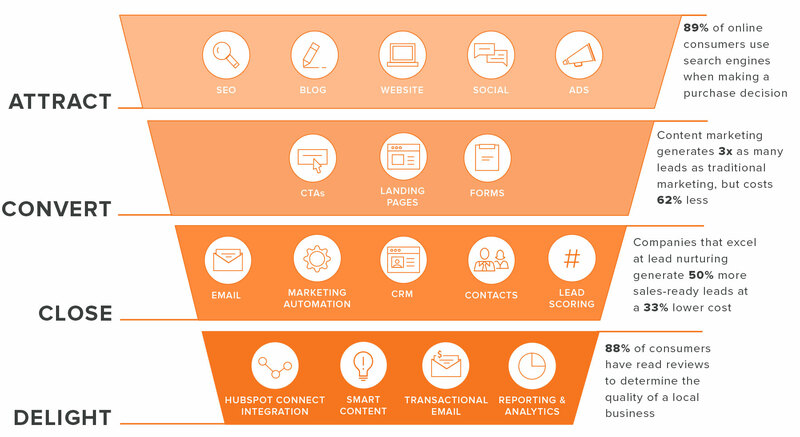 Unlike traditional marketing software, Hubspot addresses your entire marketing funnel. Hubspot is designed to generate more traffic, leads, and customers. The tools available make it easier for you to attract new visitors through blogging, social media and SEO. The blogging tool helps you create and optimize content. It includes detailed SEO recommendations so that you can improve your odds of being found as you write your blog post. Each blog post is automatically optimized for mobile devices with responsive design and automatically publish across all of your social media accounts. Adding calls-to-action buttons are simply a matter of a click. Once you publish your content, you can follow the social analytics across platforms such as Facebook, LinkedIn and Twitter. Hubspot will also provide the tools you need to optimize SEO, improve your rankings and help you get found. The Hubspot keywords tool helps you start to understand the best words and phrases that your prospects actually use when they're searching for solutions to their problems and challenges. This tool allows you to track which keywords drive the best leads and visitors to your website. It will also give recommendations for the long-tail keywords that are easiest to rank for and allow you to take a look at the keywords that perform the best for your competitors. You can also view difficulty, search volume, and paid search metrics like cost-per-click (CPC). HubSpot provides the easiest way to create ad campaigns on platforms, such as LinkedIn or AdWords, that compliment your existing marketing efforts, measure your conversion ROI and follow best practices. HubSpot allows you to measure actual conversions, not just clicks. You’ll know what clicks convert into leads and customers for each ad. HubSpot will also help you analyze and optimize your website and create high quality inbound links. There is functionality in HubSpot that crawls your pages for SEO on the spot and provides page-by-page reports and recommendations for improvement. You can also view metrics on page views, inbound links, clicks and social media. Running a business with HubSpot makes all sorts of time-consuming tasks a breeze. There are also numerous administrative functions, such as calendars, tasks and scheduling devices. 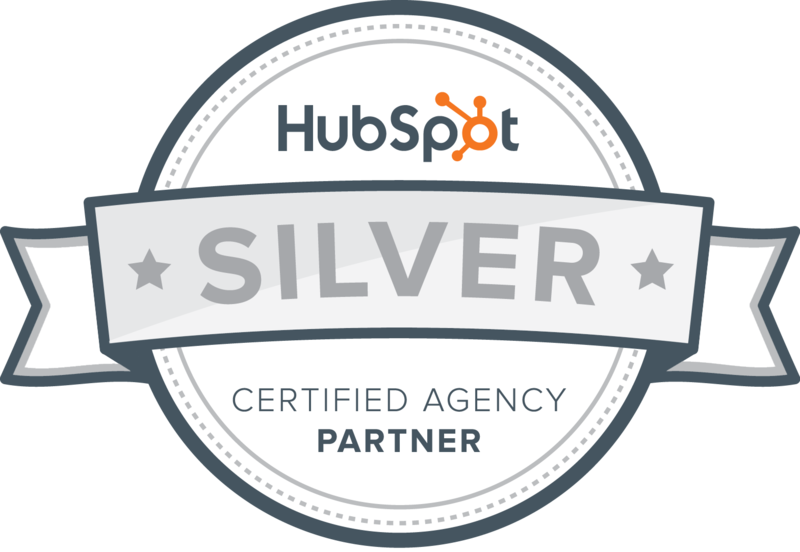 If you are ready to take your business to the next level, then you're ready for HubSpot. HubSpot has been proven to help companies attract new visitors to their website, convert those visitors into leads, and close those leads into happy customers. We're happy to talk about HubSpot. If you would like further information about how HubSpot can help your business or if you would like a free demonstration please contact us.